North Melbourne forward Nick Larkey made history on Monday night, becoming the first Shinboner to claim the VFL/VFA goal-kicking title. The Jim ‘Frosty’ Miller Medal was fitting recognition for the 20-year-old who kicked 41 goals for the year, putting him three goals ahead of Port Melbourne’s Jordan Lisle who finished in second place. The young Roo kicked two bags of five goals throughout the season, with the first coming in Round 8 against Box Hill, and the second against Williamstown in Round 18. Clearly chuffed by the award, Larkey credited North’s new VFL system for helping him perform to a high level. “I enjoyed playing VFL this season and it was good having our own VFL-affiliate,” Larkey said. “All the coaching staff in Ben Dyer, Gavin Brown, David Loader and team manager Andrew Carson did a great job. VFL-listed player Nick Rippon was North’s top vote-getter during the J.J Liston Trophy count, earning ten votes which put him in a tie for 12th. 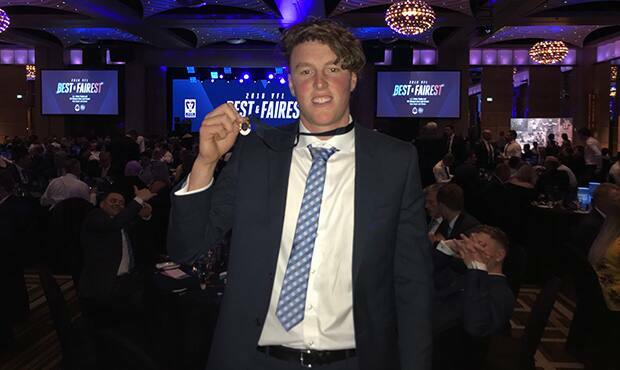 Of the AFL-listed players, Luke Davies-Uniacke led the pack for the Roos with five votes, while Braydon Preuss and Cameron Zurhaar were close behind.